Are Natural Disasters a Sign From God? Last Wednesday afternoon (August 19, 2009), five small tornadoes touched-down in the Twin Cities metro area of Minnesota. Among the damage – pretty minor by tornado standards – was the cross steeple that sat above Central Lutheran Church for over 80 years. The tornado in Minneapolis was a gentle but firm warning to the ELCA and all of us: Turn from the approval of sin. Turn from the promotion of behaviors that lead to destruction. I can understand the temptation by Christians to classify events like this tornado as warning signs from God – especially when it involves something as controversial as homosexuality and the church. However, I think the idea that we can interpret natural events as divine messages is a risky one. The problem is that when it comes to this sort of thing, some major cherry picking occurs. When a tornado destroyed the entire town of Northwood North Dakota two years ago yesterday, I don’t remember anybody claiming it was because the residents were sinful, or because they did or didn’t hold a particular belief. But somehow, when a cross was broken off the top of a church in a storm, it’s to be taken it as a warning from God? Why one and not the other? According to the National Weather Service, the United States is hit by about 1300 tornados each year, on average. Does John discern a pattern that these tornados tend to strike places that are more pro-gay, or even just generally more sinful, than others? I did a little research, and it turns out that the place where tornados tend to strike the most frequently and do the most damage is in the Bible Belt, with Oklahoma topping the list. And, interestingly enough, it turns out that those states that have the most progressive stances toward gays (e.g. Massachusetts, Vermont, New York) are among the states that typically experience the least tornado damage. 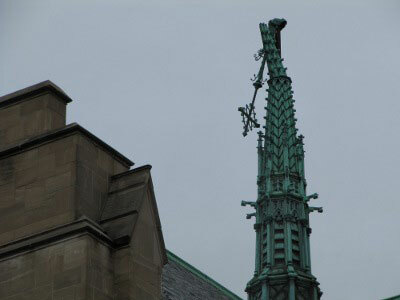 Doesn’t this fact by itself completely undermine John’s speculation as to why a Minneapolis church steeple was damaged? Boyd also addressed the event in a Q&A session at his church last Saturday evening. I’ve included a portion of it below, or you can view the entire video at Vimeo. Interestingly, a similar debate between Piper and Boyd occurred a little over two years ago when the I-35 bridge collapsed. Personally, I think that if you want to identify specific natural disasters as warning signs from God, then you need be prepared to do the same for all of them. Otherwise, we are left to determine which ones are sending a message and which ones are not. And I don’t think any human can claim to hold the qualifications for that job. In the fallen world in which we live, towers sometimes randomly fall; bridges sometimes randomly collapse; and tornadoes sometimes randomly do property damage – even to churches. That’s all there is to be said about it. Does Church and Pop Culture Mix? That Boyd guy bugs me on so many different levels to tell you the truth. I could only watch that video till the end of him promoting his book he wrote and telling a story about how some lady lost passion for God who, if truly understood the cross properly to begin with would never have been an issue. Perfect example of a product of the emergent church actually. This is what I am totally sick of in Christianity today. Pastors who try to be hip and cool and have nothing better to do then try and push their pride socked ideas on other people while wearing t-shirts and ripped jeans so they can relate to us. Give me a break. He needs to spend more time in his Bible and less time with his mouth open and definitely less time writing books. Take no offense to this J as you know I love ya man but if a tornado comes out of no where when none was expected, takes off the top of the exact church where a large group of people are meeting to allow gays not only into the so called church but to be able to teach in them as well and all this happens at the exact time they sit down to start discussing it I am going to have to side with Piper. How much more non-random does it need to be? The only thing of use in that Boyds closing statement there is we do live in a fallen world. But EVERYTHING that happens, towers falling, bridges collapsing and tornadoes, are ordained by God. It is that simple. Does he seriously think that God just created this world and doesn’t have a clue whats going on in it (and yes he does, that’s what his churches website says)? Random things just happen? God has no control of what is going on? That totally contradicts the Bible in every way shape and form. Lets just redefine the Bible while were at it. I guess you can do that though when “we just don’t know”. It’s easier to plead ignorance then use half a brain on this matter. That’s all there is to be said about it. Oh, and his attempt at saying most tornado’s happen the bible belt? Um, even someone who went through seminary should be able to figure that one out. Not only is it where the weather patterns merge to create the perfect conditions for it (duh), but God punishes those whom He loves when they are doing something WRONG. He doesn’t need to punish the un-Godly. They will get theirs far more then we can imagine. I punish my kids when they do something wrong because I love them and I don’t want them to grow up to be spoiled little pride filled brats like more then half the kids that run down our street. I am not going to waste my time to punish those kids, they don’t belong to me (though I do kick them out of my yard). However, my kids, I am their father, I watch out for them, I protect them, I love them, I teach them about God and I punish them when they do wrong. I am NOT here to be their friend. If it happens, that’s fine, but that is not my primary goal. Oh oh, and I went to his churches website. REALLY? Their own site claims in fancy words that God is not omniscient (they redefined the word). That He does not know what is going to happen in the future. Not once does it mention the preaching of the Gospel (which is a must have to be part of the Church Body) rather it says preaching God’s love (totally not the same on any level). Their entire policy is summed up in “We agree on enough to get the job done.” So many things wrong with that statement alone I will spare you extra paragraphs. Not to mention they endorse Rob Bell who is singlehandedly trying to redefine what Christianity is (and not for the better). Sometimes I worry about you J man, but you know I love ya and am watching out for you ;) Just be careful when you get into this garbage. There is a fine line that rightly divides the emergent church (which Woodland Hills Church is) and their teachings from truth filled biblical teachings. And there is a reason why you will NOT find this sort of rebuttal on any Gospel preaching Biblical Churches website. Look, Piper is a very smart guy, spent/spends his entire life devoted to study, proper teaching and preaching of the Gospel. Give him some credit. Hi Bob, thanks for the comments. Let me attempt my response here. First, A little background. For several years, I struggled with doubt, to the point where I nearly lost my faith and walked away from Christianity – a story for a different time. That process caused me to reevaluate my beliefs and why I believe them. Most importantly, my faith has emerged stronger than ever before, with a deeper understanding of God’s grace and love for us. So, while I appreciate your concern for me, there is no need to worry. And please remember that though we may differ on some issues of theology and philosophy (predestination, free will, etc. ), our belief in redemption through Jesus does not. And now, onto a response to your points. …Perfect example of a product of the emergent church actually. I know that you’d like to classify Woodland Hills and Boyd as part of the emergent church so that you can easily dismiss them, but it’s simply not true. Boyd and Paul Eddy, the church’s teaching pastor, address the topic in this video. In addition, Woodland Hills and Bethlehem Baptist Church actually belong to the same church conference, the Baptist General Conference. …He needs to spend more time in his Bible and less time with his mouth open and definitely less time writing books. If you want to make arguments Greg Boyd’s ideas, by all means do so. But ad hominem attacks aren’t helping you here. If you listen to his sermons or read his website, you’ll see that his views are extremely Biblical and backed up by scripture. Boyd he taught at Bethel University for 16 years and also happens to be a notable figure in New Testament scholarship (if you want I can lend you my copy of The Jesus Legend: A Case for the Historical Reliability of the Synoptic Jesus Tradition). And if you think Boyd should spend less time writing books, maybe John Piper should too – he has 41 versus Boyd’s 17. I do give John Piper credit for his lifetime of ministry, I simply disagree with him on some issues of theology. If God was sending a message here because of his anger and disapproval, why didn’t He destroy the church and leave every other building in the area untouched? Wouldn’t that have sent a stronger and clearer message than the breaking of a steeple? And what about the four other tornadoes that touched down that day? What message were they sending? I think Piper is engaging in confirmation bias in using this example, because while he doesn’t attempt to interpret damage from other weather events, the circumstances surrounding this one fit his particular worldview so is seems obvious to him. First, I happen to disagree with the ELCA’s vote. However, I’m disturbed by many Christians’ obsession with homosexuality, as if it’s somehow a bigger sin than the any of the others mentioned in the Bible. Yes, it fails to meet God’s ideal – as does pride, greed, lust, failing to take care of the needy, adultery, gluttony, lying, envy, gossip, etc. Sin is sin. So, if you’re saying that God cares more about homosexuality than these other sins and decided to make a point about it with a tornado, while ignoring churches rife with other every other sort of transgression, then I can’t go along with that, because it’s not based in scripture. And I hope I’m misreading your sentence from above, because I think it’s a dangerous place to be in if you believe sinners of any type should be excluded from a church. A church without sinners would be quite empty. …No wonder the lady lost all passion for God, she clearly didn’t have a clear understanding of who God is to begin with and what He has done. I think I need clarification on what you mean here, because I’m failing to see how God’s love for us, demonstrated through Jesus Christ’s death on the cross for our sins, fits in with what you’re implying. Are you saying that God took the baby from the woman in the story because of her sin in her life, or because she lacked faith? Because I don’t see how that meshes with our freedom from sin through grace, or the words of Jesus (Luke 11:11-12). Does he seriously think that God just created this world and doesn’t have a clue whats going on in it (and yes he does, that’s what his churches website says)? This is the single most common misconception people have about the open view. Open Theists and Classical Theists disagree about the nature of the future, not about how much God knows about it. Both sides grant that God knows everything. He is omniscient. He knows everything there is to know about all of reality, including the future. The disagreement is that, whereas Classical Theists believe that the future consists entirely of settled realities — and thus hold that God knows it as entirely settled — Open Theists believe that the future is partly comprised of possibilities — and thus hold that God perfectly knows it as partly comprised of possibilities. While I could go into deep detail about it here, in the interest of time and space, there are plenty of web resources to refer to, plus I’d be happy to get you a book on the topic if you’d like. I guess you can do that though when “we just don’t know”. It’s easier to plead ignorance then use half a brain on this matter. That’s all there is to be said about it. A word of caution is needed when inserting specific divine action by God in this or any other area where scientific understanding is currently lacking. From solar eclipses in olden times to the movement of the planets in the Middle Ages, to the origins of life today, this “God of the gaps” approach has all too often done a disservice to religion (and by implication, to God, if that’s possible). Faith that places God in the gaps of current understanding about the natural world may be headed for a crisis if advances in science subsequently filled those gaps. Faced with incomplete understanding of the natural world, believers should be cautious about invoking the divine in areas of current mystery, lest they build an unnecessary theological argument that is doomed to later destruction. …Not only is it where the weather patterns merge to create the perfect conditions for it (duh), but God punishes those whom He loves when they are doing something WRONG. He doesn’t need to punish the un-Godly. They will get theirs far more then we can imagine. Almost all of the reward and punishment teaching of the Bible is given by God to Israel, not to humanity in general. The covenant relationship God established with the Hebrews in the Old Testament – and the punishment that went along with it – is no longer in place under the new covenant we have through Jesus. That’s not to say that He doesn’t do it today, but frankly, it doesn’t seem to be a very effective method for bringing about correction. Going back to the mother who lost her baby upon delivery – what lesson, exactly, is she supposed to take away from that experience? Is she being punished, or is God punishing the baby? She’s left to guess at the reason behind that tragedy. In a parent-child relationship, a punishment handed down without a reason why is not only unhelpful, but cruel. In the context of my original blog post about natural disasters, your comment about God not needing to punish nonbelievers doesn’t fit with reality. Natural disasters, of all things, do not discriminate between Christians and non-Christians. I can give you example after example: the wildfires in California occurring while I write this; Hurricane Katrina in 2005; the 2004 Indian Ocean earthquake/tsunami; the 2008 Sichuan earthquake. If God is using these events to punish believers, He’s leaving behind a lot of collateral damage – particularly in regions of the world where the number of non-believers dwarf the number of believers. One side note is that a lot of people seem to mistake discipline for punishment. The two are not interchangeable. The root world, Discipulus, means disciple, or “pupil, student”. The act of discipline is guiding the learner toward positive behavior while learning from their mistakes instead of making them suffer for them beyond the natural consequences. Punishment focuses on the person in authority being responsible for controlling the disciple’s behavior instead of them controlling it themselves. Their own site claims in fancy words that God is not omniscient (they redefined the word). That He does not know what is going to happen in the future. So the Bible presents God as interacting with a world that is moving into a partly open future. This doesn’t mean that God could ever be caught off guard or that his overall purposes for the world are ever threatened. Because they believe God is infinitely intelligent, Open Theists affirm that God anticipates each and every possibility from the foundation of the world, as though it were a certainty. Whatever comes to pass, God has a plan in place to respond to it, bringing good out of evil when this is necessary. But, unlike Classical Theists, Open Theists are confident that God is so smart, he can sovereignly rule the world effectively without needing to have everything pre-settled in his will or mind ahead of time. Not once does it mention the preaching of the Gospel (which is a must have to be part of the Church Body) rather it says preaching God’s love (totally not the same on any level). Comparing Woodland Hills site with Salem’s and Hope’s (our church), I honestly struggle to find many differences. Your statements could equally apply to your church. If you’re really questioning the foundational teachings of Woodland Hills, I recommend listening or watching some of their sermons. They’ve been working their way through Luke verse-by-verse for the last 5+ years, with occasional breaks for topical series. June 28th’s message titled Gatekeepers of the Royal Son is a perfect example of what they teach: The raw Gospel message, stripped of religion. Their entire policy is summed up in “We agree on enough to get the job done.” So many things wrong with that statement alone I will spare you extra paragraphs. We do not exclude anyone on the basis of a different view on baptism, gifts of the spirit, predestination vs. freewill, or any other matter of honest theological disagreement among members of the Church. The people of Woodland Hills are not connected because we all dot our i’s and cross our ts the same theologically, but because we align ourselves with a common vision and mission as Jesus’ disciples in the city of St. Paul. You may disagree, but I see absolutely no issue with this statement. I personally can’t stand when churches demand you buy completely into their mono-culture, as there always has and always will be plenty of areas of legitimate disagreement within Christianity. Not to mention they endorse Rob Bell who is singlehandedly trying to redefine what Christianity is (and not for the better). I’ll admit that I’m not all that familiar with Rob Bell, but from what I’ve read by him and about him, I haven’t seen anything to make me believe he’s “trying to redefine what Christianity is”. Now, I know you’re a fan of Mark Driscoll, and that he believes Bell to be a heretic, so maybe that’s where you’re coming from – I don’t know. I feel that I’ve responded to your last paragraph in bits and pieces above, so I’m not going to take up more space down here. So, wrapping up, it’s obvious that we have some genuine disagreements on theology, philosophy, and even on how we view God. I’m not going to try and tell you that I’ve got it all figured out, because I honestly don’t. I don’t think anybody can (or should) claim that. And I think you’re making a mistake when you come to the conclusion that your particular understanding of Christianity IS Christianity.